TMD Technologies is attending the EMV 2018 event in Germany next month with its 6U rack mounted range of EMC amplifiers. West London based microwave and RF product specialist, TMD Technologies, will be demonstrating its capabilities in the field of EMC on stand 3-411 at EMV 2018, the international exhibition and conference on Electromagnetic Compatibility (EMC) taking place in Düsseldorf, Germany from 20th to 22nd February 2018. 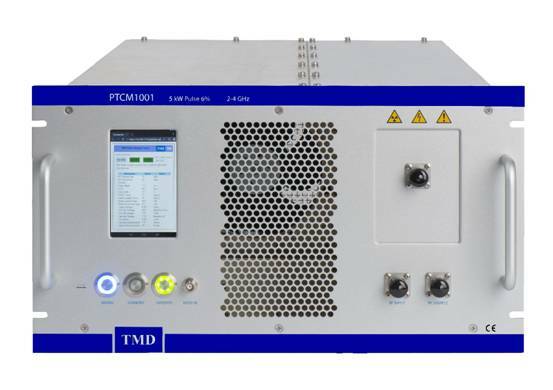 TMD’s capability in this arena is exemplified by the recently introduced PTCM Series of intelligent, modular TWT (Travelling Wave Tube) RF instrumentation amplifiers. “This innovative product offers the highest performance and a wealth of operational benefits in a compact package. It was well received at the recent MWE 2017 event in Japan, where interested visitors recognised its potential for not only EMC/EMV but many scientific, medical and other applications,” said Imad Gharib, TMD’s Sales Manager, RF & Microwave Amplifiers. The PTCM Series operates over a frequency range from DC to 40 GHz with a power output up to 50 kW. Of customisable 6U high rack mounting construction, the series is designed to deliver the highest field strengths in test environments. The user benefits provided by these highly intelligent amplifiers include self-test, fault diagnosis, modular plug and play replaceable printed circuit boards, Ethernet remote control and monitoring and VSWR (Voltage Standing Wave Ratio) reflected power protection. A ‘system-on-chip’ (SOC) controls and synchronises all power conversion circuitry in real time, and all the monitoring, control, data logging and user interface functions. The modular 6U system also allows a number of configuration options according to customer requirements. “We are very pleased to be exhibiting at the EMV exhibition again, and be part of the wide spectrum of EMC/EMV professionals attending from industry, commerce, defence and science,” said Andy Crawford, TMD’s Head of After Sales and Support Worldwide. “Not only do we offer a full range of microwave products for EMC/EMV applications but, as part of our comprehensive support portfolio, we can supply customised units to customers’ own specifications, as well as providing full turnkey systems,” he concluded.